For the long term we see that the 13 month cycle is quite important for Nifty and so the 13th month will be September 2014. Since time cycles expand and contract, we give an orb of +_2 months. We are approaching a crest of significant proportions in the next two months. 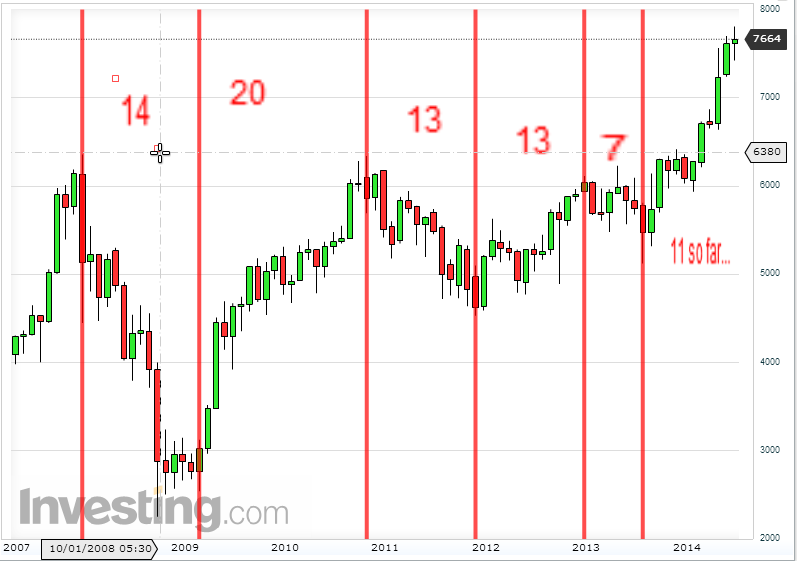 Of course, we continue to believe that the very long term trend is quite bullish. Let us look at the wave counts…. Nifty had technically surpassed and closed beyond 7660, at 7664.This marks the 61.8% retracement for the fall from 7809 to 7422.So the odds that Nifty is forming a flat from the top of 7809 is higher now. Price, movements on Monday should confirm the picture. If so, f wave of the diametric is just on. 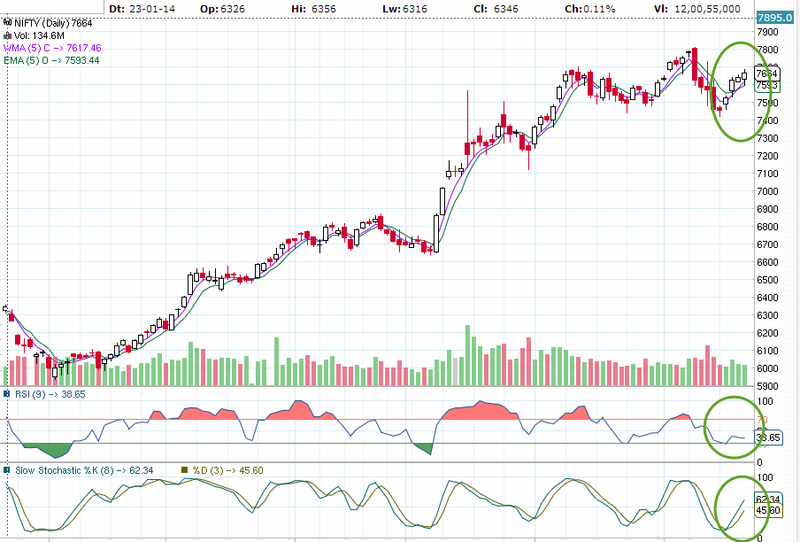 It had completed one leg “a” at 7422 and currently it is “b”. This b wave could retrace anywhere between 61.8 to 80% where it will be a weak b wave. 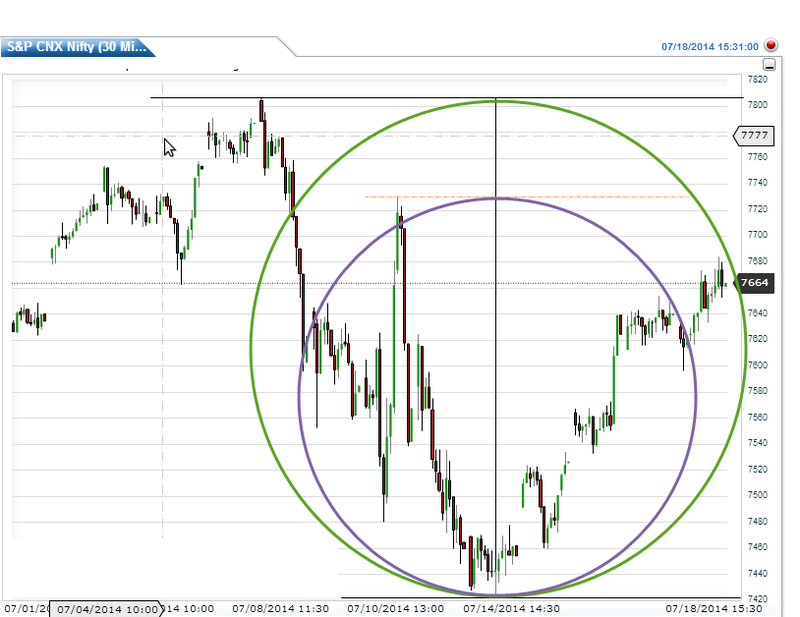 If it retrace 101 to 123.6% it will be a normal b wave and anything beyond that it will be strong b wave. We expect b wave to behave normally and later on go back to the base or beyond, as wave c of f, from where wave” a started. If so, then wave g of the complex corrective will unfold later on as an upmove. So we expect the bull move to continue this week with volatility. July 24th and thereafter have to be watched carefully. A look at the short term cycles..
As per this chart, we see that Nifty is close to a reversal zone.. When can we see trend reversal changes? Let us examine the Astro picture. Whew! What an array of indications! On 22 July, Tuesday at 12.19 pm, Mercury will be in full opposition to Pluto. Market could rise towards this date and time. July 25, 02.30 am, Sun is conjunct Jupiter. Which means Jupiter is conjunct. Crest should form soon. July 27: New Moon at 04:12 a.m. This looks like the current uptrend could terminate by July 24 or 25, 2014.Then b would have been completed and the downward c should begin. The next option is that the current upward wave movement be construed as wave g of the diametric.. 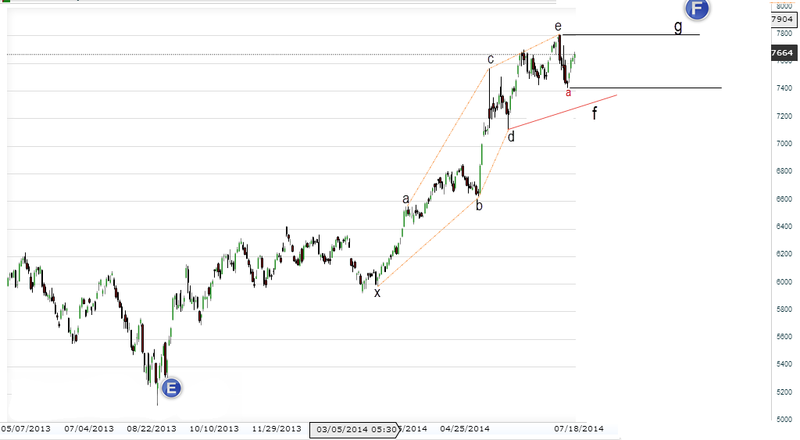 In such a scenario, wave g has opened upwards and may continue for 3 or 4 days. But this count now looks improbable now.Closer to the New Moon, looks like an opportunity to create shorts, with stop losses.Last but not the least, allow price to move first in the direction of our expectation, before any trade steps are initiated. Time band 24th July to 7th Aug is important. I agree. Mercury will be conjunct with Sun then. Bullishness tend to disappear once Mercury moves away from the Sun. But I had wanted to take it one week at a time! Nice Analysis Suresh.. adding to that Nifty is forming H&S patterning daily chart ...max I can see 7850, every opportunity would be for sell for positional player ...however... play with strict SL. Thank you Mohanty. I had a look at your link. 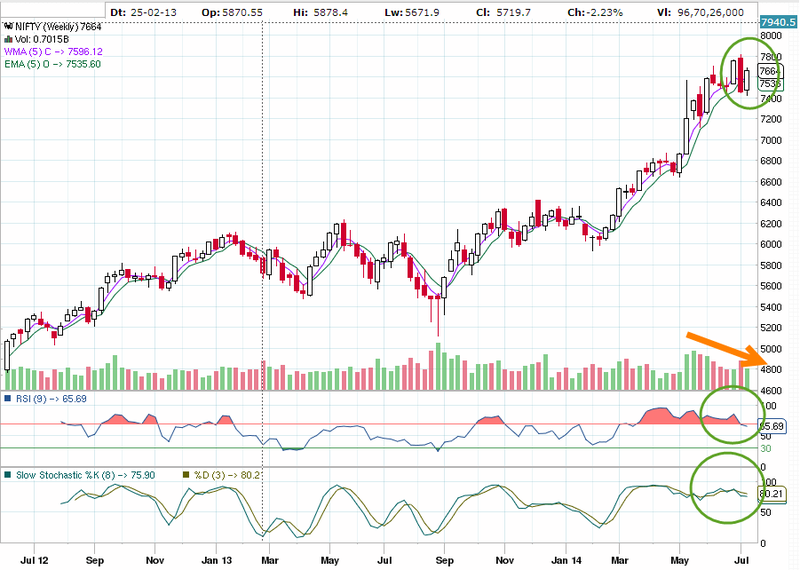 Negative divergence also is beginning to develop in the 14 day RSI.We should first wait for Nifty to reverse from a height. Let us see how far she will go..
really ! market dancing at yr tune! c in process with b ending at 7841? whats target and time frame? Thank you Pankaj.My love affair with our markets goes back to 1990.Most of the time she has made me dance to her tunes! But then every time I dance I learn something from her..Nifty. she truly is an enigmatic mistress! Nice to see you after longtime ... As usual wonderful, simple and crystal clear analysis.. Hoping to learn many more things in coming days.. Tc .. Thank you for your comments, Leon..